Two million blog posts are written every day. You can only imagine how many other content pieces are out there. This information overload makes it extremely tough for marketers to stand out. Sometimes, all it takes is one viral infographic or video, but most times, that isn’t the case. Rather than focusing on what content to publish, you should also be focusing on who delivers your content. This is where employee advocacy comes in. 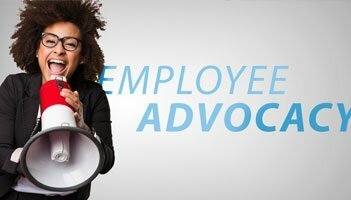 Above all, the content that you provide employee advocates should be of high quality. But what defines “quality content”? Quality content can range from a 4,000-word eBook to a 1-minute video clip. It can take weeks to produce, or just a few hours. There’s no set criteria for creating quality content. However, you need to make sure that employees are sharing content that exceeds their audience’s expectations. Focus on content that is valuable yet super engaging. posting polls and statistics that get people involved. Next, don’t settle for one type of content ‒ go for a variety of original and curated pieces. Original content includes eBooks, case studies, webinars, blog posts, etc., that your marketing team created. Curated content consists of valuable articles and resources from third-party websites that educate your audience in a less self-promotional way. Moreover, creating content that is valuable boils down to matching your readers’ intent. Take advantage of employees’ ability to gain insights and opinions about their audience; then use this information to create content that they’ll be interested in. This will also empower your advocates by proving their impact in the program. Now, more than ever, customers want you to connect with them on a real and personal level. Employee advocates add this element of personalization by putting faces to your brand. They create a human bridge between your company and customers. Taking this element of personalization to the next level, you can increase engagement by getting employees to share content that’s relevant to their role in the company and to the particular audience. For example, consider your salespeople. What type of content do they enjoy sharing? What type of content is going to best resonate with their audience? Generally, your salespeople are more likely to share thought-leadership pieces, industry-related reports, and articles from well-known publications, because these help to position them as knowledgeable and professional. On the other hand, content that’s technical in nature will be perceived as less relevant by your sales team ‒ and similarly, by their audience. Another way to set your employee advocacy program for success is by fostering an environment of easy and effortless sharing. Whether advocates are attending a conference or sitting on the bus, it’s important to make it as simple as possible for them to share a large amount of content, no matter where they are. By using a proper social advocacy platform, you can make tasks like sharing content an easy daily routine for employees. Rather than having to search for content on their own, employees who use an advocacy platform like Oktopost are guided on which content topics to post, when to post, and how to do so. Giving employees the necessary tools will get the ball rolling in your program and ensure that more content gets shared. Employees are the most essential asset of your marketing initiatives. Failing to incentivize them will result in less content being shared. Research shows that 69% of employees would work harder if their efforts were better appreciated. Learning Opportunities: Give advocates the opportunity to improve their skills and expertise in the form of seminars, guest lectures, and training activities. Recognition: Acknowledge employees for their involvement and contributions in front of their co-workers to boost their sense of confidence and accomplishment. Fun Activities: Invite advocates for a fun and easygoing activity like a movie day or a night at a bar. Such a reward should be offered to the team or department that achieved the highest performance in the program, for example, the most content shared or the most clicks generated. The type of incentive strategy you choose will depend on the number of advocates you have, your company’s hierarchy, and the personas that make up your program. For example, advocates from sales are more likely to value monetary rewards, while marketers will most appreciate public recognition. It’s easy to launch a program and then just hope for the best, but to make it a big success you must track and analyze its performance every step of the way. First, ask yourself what “success” looks like in your program. Is it the impact on reach? The increase in social chatter about your company? Or maybe the growth in the number of leads? By setting specific KPI’s, you can determine what’s working and what’s not. You can understand if your content needs improving, if you’re posting to the right channels, and if you’re reaching the right audience. It’s important that you accurately tie these metrics to individual employee performance and to ROI. For the latter, you’ll need an advanced platform like Oktopost. Oktopost consolidates all of your social media marketing activities in one place for easy management and reporting. In your advocacy program, Oktopost allows you to track everything from which prospects converted, to which employee brought in the conversion, to the type of content the employee posted. It also enables you to measure the metrics gathered by your advocacy program in the ecosystem of your other marketing initiatives. The more you measure and make adjustments, the more successful your program will be. A winning employee advocacy program requires a lot more than giving employees content to share. Implement these five elements for a sustainable and fruitful program that can be tied to ROI, and help your employees spread the word about your brand. Is your employee advocacy program optimized for performance?